Launched in Kuala Lumpur last month, the Samsung Galaxy A9 is on its way to India and could sell for a price of Rs 39,000. It appears Samsung is poised to launch the new Galaxy A9 smartphone in the Indian market. Its product page for India is already live and shows the smartphone’s unique camera setup in a teaser image. Launched last month in Kuala Lumpur at a Samsung smartphone event, the Galaxy A9 comes with a quad-camera setup on the back with varying lenses. Vertically stacked, the rear camera setup includes an ultra-wide lens, a telephoto lens, a regular lens, and a depth sensor. It also includes a single LED flash. By digging into the source code of the product page, Mobigyaan was able to discover the price of the Galaxy A9. It is expected to be around Rs 39,000 at the time of launch. Apart from the freaky four-camera setup, the Samsung Galaxy A9 features a 6.3-inch Full HD+ AMOLED display with an aspect of 18:9. It’s powered by a Qualcomm Snapdragon 660 chipset with an octa-core processor, where four cores are clocked 2.20GHz and the rest are low-powered ones clocked at 1.80GHz. The battery on the smartphone is a 3,800mAh unit that supports fast charging. Though the Samsung Galaxy A9 is available in 6GB RAM and 8GB RAM variants in many countries, only the former is expected to make it to India. Internal storage capacity is 128GB. External storage using a microSD card is supported up to a maximum of 512GB. The Galaxy A9 also features Bluetooth 5.0, NFC, and a 3.5mm audio jack. In addition, the smartphone is expected to bring Samsung’s proprietary features like the Bixby virtual assistant, Samsung Health, and Samsung Pay. When launched, the Samsung Galaxy A9 is expected to be sold in three colours: Caviar Black, Lemonade Blue, and Bubblegum Pink. 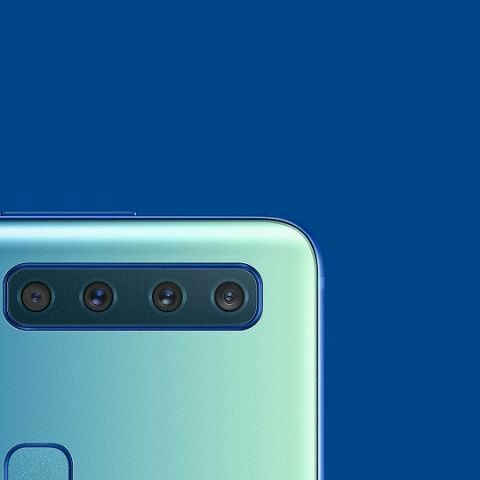 The Galaxy A9 has no confirmed date of launch yet but according to numerous sources, it is scheduled to launch on November 4. Samsung and many other phone makers out there in the industry seem to be in a race to add more cameras to the back of their smartphones, but only a full-blown review will tell us how much of a difference the number makes to everyday photography.